Linxx Buckle is a new ground-breaking revolution in the ratchet belt industry! It's an easy, quick, sophisticated buckle that better performs! It proofs to be a huge time saver, and hassle-free procedure when used! Merely lift the buckle to release! No need to worry of sudden open belt due to unintentionally pressed button, adjusts all day while your waist fluctuates-in the simplest manner! Finally, the belt we've all been waiting for, now hot on the market! Try it you'll be stunned! Our amazing features offer you an effortless and efficient experience! The tip of the belt slides into the ratchet belt buckle, where a locking mechanism holds the belt in place on our unique tracking system and auto locks it. 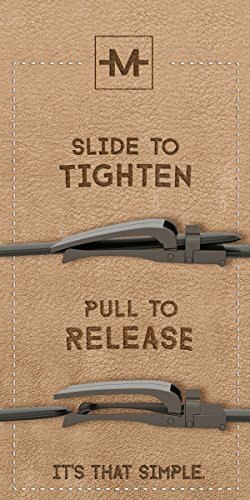 To remove the belt, simply lift the buckle, and get a smooth inaudible release! Marino offers an array of modern, and traditional dress belts. Our stylish sophisticated buckles are suitable for everyday wear as well as special occasions. 2. Cut the belt to your desired size and secure it firmly. You're no longer restricted to 1" size adjustments, but can get a perfect, Adjustable form-fit all the time! Marino is here to provide our esteemed Adjustable formers a pleasant experience. Our 45 days return policy, plus 180 days warranty, enables you a risk free purchase! Our mission is that you be extremely satisfied with your belt! 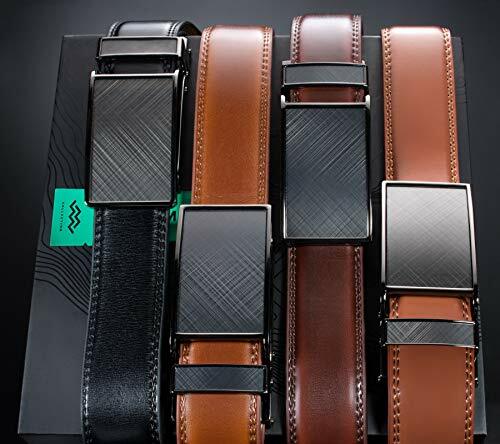 Linxx buckle - Is the new INNOVATIVE EFFORTLESS SOLUTION. Just lift the buckle to obtain an inaudible release! Extremely easy to use! Slide belt in to tighten and the belt auto locks - simple smooth and sleek. 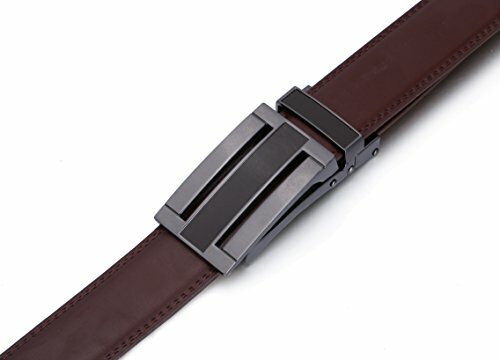 No more holes - Marino fashion ratchet belt provides 38 unique adjustments for an extremely comfortable fit. 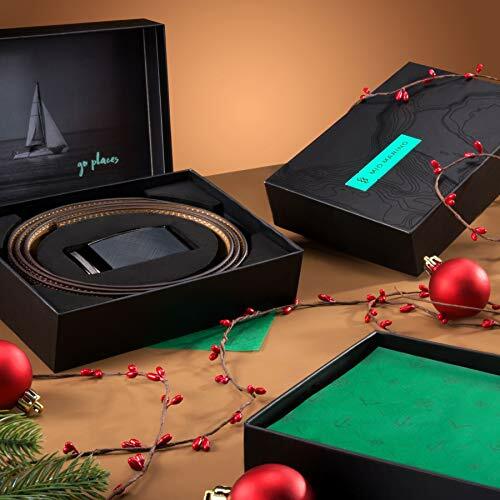 Marino leather belts for men features an easy removable buckle that allows you to cut the belt to your ideal size to give a primmer appearance! 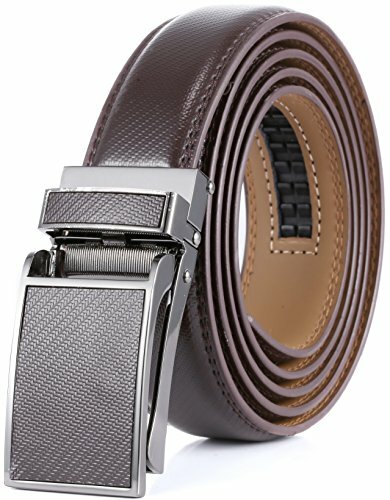 Maximum durability - Leather strap is a bit wider than 1 and an 1/8" presenting the perfect look of a fine genuine leather quality dress belt, complemented with an HIGHLY FASHIONABLE stylish buckle that is elegantly designed with class. Scratch resistant buckles are made to last. Gift box - Make a big impression! Enclosed in a lovely, attractive gift box. Special bonus leather key chain included! 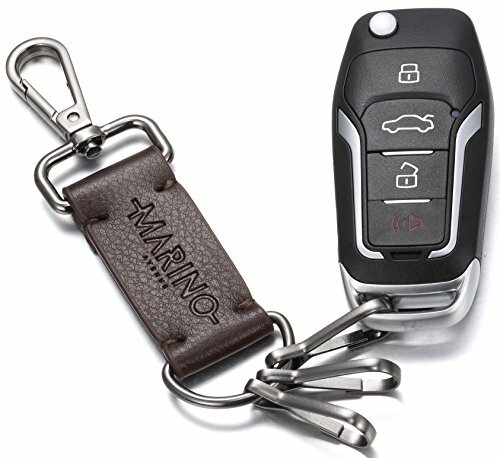 Marino Avenue offer awesome gifts for men that is presented with elegance and flair to impress your loved one. Order with grace 100% satisfaction guaranteed, 45 days free exchange and returns, plus 180 days warranty.